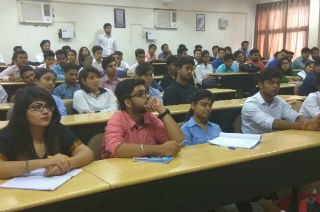 On 3rd September, 2016, The IP Department organized a Guest Lecture on “Career Counselling” for BCA 3rd Sem Students. 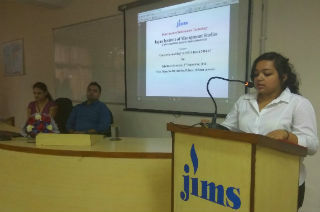 The session started with welcoming the guest speakers- Ms. Chestha Malhotra-HCL Technology & Mr. Yatin Attri-Nyle Technolgies. Mr. Yatin obtained his MCA degree from JIMS in 2008 and is working as Solution Architect with Nile technologies. He had worked in different organizations: Infosys, Ciena, Init, SDG with a total working experience of 8 years, He is working with an array of technologies like Core Java, J2EE, .Net Framework, Oracle Fusion Middleware suit, SOA and others. Yatin is working as solution architect and middleware design consultant for Airtel, Aircel, Telenor, SBI Credit Cards, Himachal Pradesh State Electricity Board and many more. Ms. Cheshta too did his MCA degree from JIMS in 2012, Cheshta is working as “Lead Engineer” with HCL technologies. She had been working with different organizations: Appin, Quantis with a total working experience of 3.5 years, She is working with an array of technologies like Core Java, Struts, Springs, C#.Net,ADO.Net Toad, Oracle and Crystal Reports, AngularJS, PostgreSQL, Presto, JQuery, JSON.